Send the store! Let family, friends and colleagues select mouthwatering coffee cakes, superb gourmet coffee or tea, stylish and functional travel coffee mugs and French press coffee makers. A treasure house of gifts for coffee lovers and tea lovers. Your $20 Gift Certificate will be e-mailed within 24 hours after purchase and can be sent by US-Mail if you prefer. 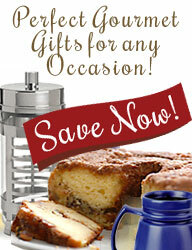 E-mail Gift Certificates from CoffeeCakes.com are extremely easy to purchase and redeem. More gift certificates.